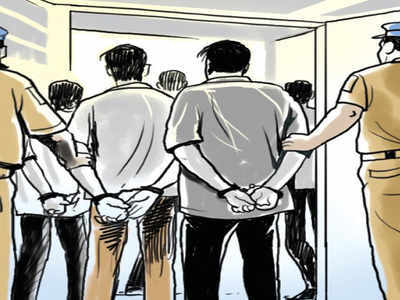 ROORKEE: The special investigating team (SIT) probing the multi-crore SC/ST scholarship scam on Tuesday arrested three people for allegedly siphoning scholarship money to the tune of Rs 2.5 crore from the social welfare department by submitting a fake list of students. The accused have been identified as Qazi Nooruddin, Pradip Agarwal and Sanjay Bansal. Qazi Nooruddin is a younger brother of Manglaur Congress MLA Qazi Nizammudin. Pradip Agarwal is the son of a reputed businessman from Manglaur and Sanjay Bansal is a resident of Dehradun. The accused had started a professional studies institute, Techwords, at Manglaur, 6 km from Roorkee, in 2009 to offer educational programmes in engineering and management — BTech, MBA, BBA, BCA, MCA, etc. However, the institute failed to get due affiliation from the Uttarakhand Technical University to run these courses but remained operational till 2014. It was shut in 2015. The SIT team reportedly found that not a single student could pass in any course offered by the institute. It was also found that names and details of 99 per cent of the students were fake. The institute had received scholarship money to the tune of Rs 2.54 crore meant for SC/ST students from the social welfare department between 2012 and 2014. “We are surprised to find out how the social welfare department allocated scholarship funds to an institute which did not have any recognition or affiliation with any accredited university. A detailed investigation in this matter is underway,” said SP-crime, Haridwar, Manjunath TC, who is also head of SIT. An FIR under sections 420 (cheating), 120b (criminal conspiracy) and 409 (criminal breach of trust) against the accused has been filed.